THE DISTORTION THEORY: WHEN FLYING SAUCERS CAME FROM "RUSSIA"
WHEN FLYING SAUCERS CAME FROM "RUSSIA"
For many years the UFO phenomenon presented numerous variations on the typology of the "flying saucers" and the appearance of crew members demonstrated an evolution in its manifestations, parallel to the development of our technology, culture and civilization. It is clear that the first years of research is very different from that compiled at present. For example, after the sixties decade, UFO crews have not been, generally, described with spacesuits and breathing apparatus. That descriptive base has declined considerably. This change reflects that the intelligences behind the UFO phenomenon adapts to the technology of the time to create their appearances, according to the theory of Distortion, where UFOs are simply created by the "imagination" of witnesses and therefore their appearance depends on the "oneric creativity" of the observer. The external agent uses psychic material included in the unconscious of the witness, to make its "alien visitation," and depending on the observer's cultural wealth, studies, literature, film, et cetera, stored in his psyche, the witness is able to, in sympathy with the external agent, build a close encounter with more or less detail. 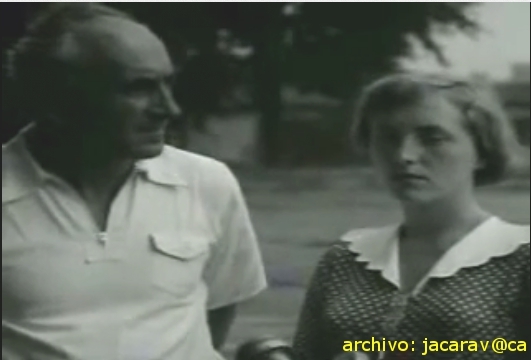 On June 17th, 1950, Oscar Linke, 48, and his daughter, Gabriel, 11, returning that night to the town of Hasselbach (located in Germany, and controlled by the USSR) had to stop when their motorcycle had a flat tire. 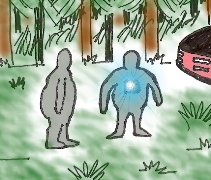 They thought they, saw at a distance 140 meters, inside the forest, two deer, but as Mr. Linke approached, to about 10 meters away, he saw two humanoids, dressed in clothes made of a bright substance and metallic. "They were dressed in heavy garments, like people wear in polar regions". The beings were moving like "bears." One had a flashing light on the chest, described in some reports as a "flashing box." The beings seemed to be examining the area and one of them was seen picking something up from the ground. Near the two humanoids was a circular object, pink, with a diameter of approximately 15 meters. At its periphery were two rows of slots 30 centimeters in diameter, separated by about 45 cm. At its top, in the center, was a cylindrical, black tower protruding about 3 meters. The two humanoids rose on one side of the object and when inside the cylinder, it began to vibrate. The row of slots began to shine and the edge started to spin. The tower appeared at the bottom then and the object lifted off the ground. "From the swirling effect of the glowing Linke got the impression of a spinning top." As the engine seemed to increase, the cylindrical tower appeared again at the top. It made a whistling sound like a bomb falling, but somewhat softer. From the the hull, along the edge, emerged red and green flames, like a jet. After gaining some height, the object moved parallel to the ground. The witness claimed: "It moved faster than any fighter he had seen and made a terrible roar." The object flew in the direction of Stockheim [Germany]. A shepherd named Georg Derbost, at a distance of one mile or mile and a half, said he had seen what he thought “was a comet [that] bounced off the earth.” An anonymous worker from a nearby sawmill, described it as a "comet" flying low. When Linke examined the site of the landing, he found a depression in the ground, which had been made by the tower that raised the landed object off the ground. Nearby there appeared a piece of land with grain crushed in a strange way, perhaps by effect of the propulsion of the artifact. The witness told the press that he had never heard of flying saucers until he escaped from East Germany. Linke always thought that the object was made in Russia and he feared reprisals for having seen a secret test of some kind of secret weapon. a prototype of Soviet origin. The jet propulsion, with flames and noise, obviously a rudimentary technology for an alleged alien spacecraft, reveals that the “elements” used a manufacturing experience dredged from the psyche of the witness. The scene of the sighting, East Germany, took place where the oppressive Russian presence intimidated all its inhabitants. This case has interesting similarities to many incidents that occurred in the decade of the 50s and 60s where the crews of flying saucers were described with an everyday human appearance and dressed as if they were test pilots. Here is another interesting example of a close encounter with "Russian-like prototypes." On July 20th, 1965 at 08:30 hours a Ramon Eduardo Pereyra, 38, was driving his furgontea by El Monte de los Curas (Villa Florida), 18 kilometers from Buenos Aires. It was raining slightly when he noticed an odd lighted parachute descending from the heavens. He stopped his vehicle and walked about 600 meters in the direction where the object had fallen. 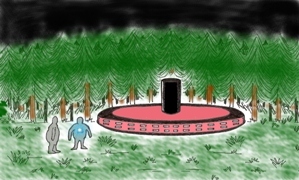 On reaching the forest he found a egg-shaped artifact, about 2 meters in diameter, with the top formed of a transparent dome-like, "plastic material.” The object had no wings or propellers, and it showed no visible connections or rivets. The lower part had an appearance of steel, and the witness noticed two leaks on its sides. Mr. Pereyra noted that the top of the artifact was the cockpit of the aircraft containing two anatomical seats, positioned back to back, against which there were panels with multiple colored lights of green, yellow and red. In one seat was a humanoid, wearing an adjusted, gray, lead-like suit with a hood over his head. The "pilot" seemed not to notice the presence of the witness, who saw that the object was supported on two legs. Mr. Pereyra walked about five meters into the forest at a distance of 30 meters from the aircraft, where he observed another humanoid, dressed in the same way as his colleague, but with the hood on his back. The being was between 1.75 and 1.80 meters high, and stood next to a tree holding in his right hand a piece of paper. Around his neck hung large binoculars, and on his right leg, a military holster. 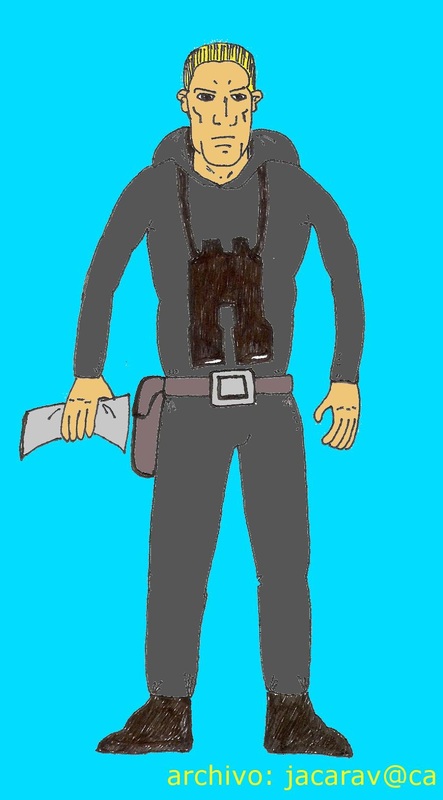 He wore a belt with silver buckle, and had on short leather boots. He had blond, combed-back hair with a perfectly normal face, with strong features. Without fear the witness walked up to the humanoid, who came quickly towards him. When about two meters away, Pereyra asked if he needed something thinking that the "aircraft" was damaged. The humanoid did not respond although the witness said, by the expression on his face, the being seemed annoyed by his presence in the area, and walked without a word to the object. With his hand, the being touched the transparent dome that opened. He got in his seat, and the small artifact made a slight sound, like welding, from the two nozzles on the sides. It slowly rose, vertically, while the legs retreated and then stopped about 20 meters above the treetops. It then rose at high speed like a meteor. 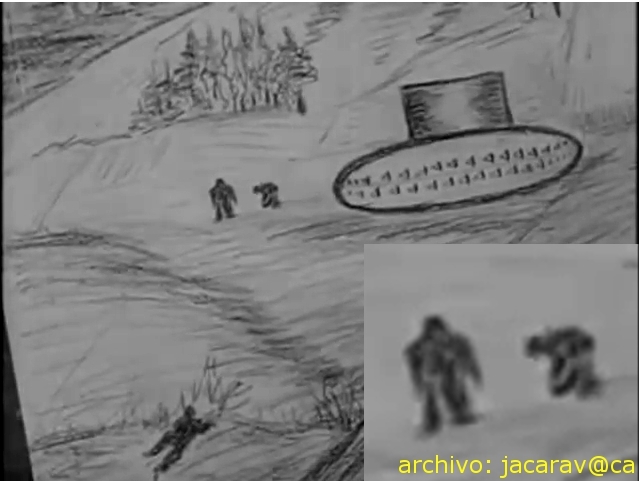 Like Oscar Linke, Pereyra says that mysterious object, appeared to be a terrestrial artifact under test, and by its appearance of the crew, a Russian creation. Even in interviews as recent as 2001, at age 72, Ramon Pereyra is convinced that his close encounter was caused by a secret aircraft of human origin. These cases demonstrate that the UFO phenomenon, via the external agent, uses the witnesses’ unconscious resources to elaborate on the experience, and represent the "close encounters" in a particular form, with a clear relation to the creative ability of the observer, all under the supervision and control of the external agent. So it would not be an intelligent and manipulative "control system" that determines its appearance depending on the era in which it manifests itself to humans, as advocated by some researchers, such as occurred during the exciting wave Air-Ship (1896/1897). Simply we are dealing with a phenomenon of parasitic type, that can tune in and communicate with the psyche of the witnesses, and depending on a given concept (extraterrestrial visitation, Marian apparition, a creature cryptozoology, et cetera) is able to recreate (adjust) the scene and put it into operation, as if it were a theatrical performance, with a light oneiric "touch." Somehow, the external agent depends on people's beliefs (faith) to form its manifestations. 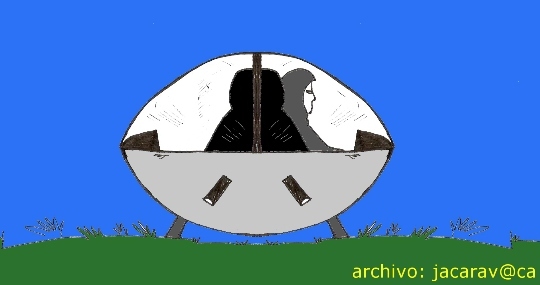 Therefore, if the paradigm of "secret prototypes" (Russian, German or American, for example) would have been more present in the global consciousness, with a greater presence and popularization in the mass media, it would have presented a better theory accepted by most researchers (as occurred in the case with the Air-Ship). It is likely that close encounters with the appearance human pilots, ordinarily dressed, would have increased, exponentially, in number during the past decades, instead of such incidents beginning to disappear in the seventies. The popularity and influence of the extraterrestrial theory and its importance in film, television, literature, et cetera (that allowed its unstoppable incursion in the popular imaginary), show that other-worldly aliens were the undisputed protagonists of close encounters. It is very probable that the content of close encounters (type of flying saucer, aspect of the crew, humanoid behavior, et cetera) is not premeditated in advance before contact occurs between the witness and the external agent. The development of the experience is "improvised" based on the creativity of the witness, minute by minute. However, the process of the encounter, while variable, is relative to the unconscious material residing in the mind of the witness.